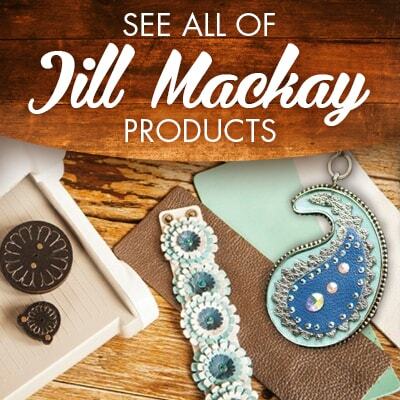 Use your Big Shot machine to make beautiful leather jewelry with Jill MacKay designs. CraftDirect.com carries all the findings, Movers & Shapers dies, and leather material you need to make amazing projects. It's so much fun to craft with supplies that inspire you, and that's exactly what you get with Jill MacKay. There are two types of leather material in this collection: cowhide and lambskin. Both will get the job done and come in beautiful colors. You can use other brands of leather too! Use the magnetic die sets to cut out bracelets and embellishments in a variety of shapes, sizes, and patterns. Nobody else is doing what Jill does for leather jewelry making, and we are so excited for our customers to put her products to the test. Jill MacKay has over 25 years of creative experience, including television set designs for Guiding Light and Star Trek: Next Generation. Amazingly, she is also a published writer contributing to various reputable sources. Now she brings her talent to the craft world, much to all our benefit!